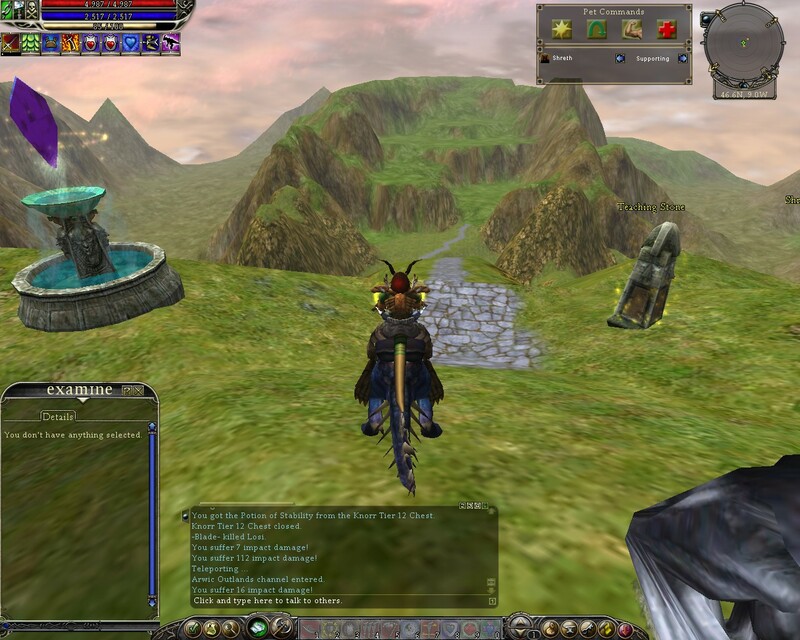 I pulled out a few of my old screenshots of Asheron’s Call 2 to share. I find these interesting because they show the user interface and you can see how it really was not that different from the MMOs that came after it. The first one is of my Feral Intendant fighting a Squall Tyrant out in what we called the Tyrant Bowl. You can see my shreth pet off to the left. The boxes below my health bar are all my buffs and debuffs. This next one is of my FI about to finish off a Storm Tyrant and a Squall Tyrant has noticed me. He is moving in for what he thinks is an easy kill, but I did finish him off too. Yes it was fun to feel like a hero. The third shot is me standing where you first arrive in Dereth after the training, just outside of Arwic down the hill. This final shot I included because it shows me just outside of Arwic and it also shows the inventory management system. Hope you enjoyed these little peeks back into Asheron’s Call 2. I miss the “moose” emote the most….